Excellent evergreen west coast native shrub that is always at its best. 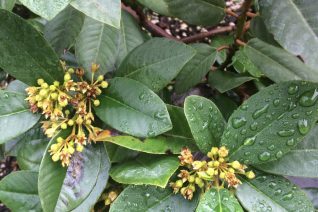 Large, glossy deep green foliage clothes the stems densely on a compact but large growing form of California Coffeeberry. Insignficiant tiny green flowers in summer/autumn turn into crops of red then brown berries. Very showy until stripped by wildlife. This species is native from SW Oregon through Calfornia west of the mountains. Completely drought tolerant- in fact it resents summer water. To 8′ x 8′ in 5 years. Wild areas, informal low water hedges, blasting urban heat. We should take advantage of these climate adapted west coast plants for the toughest sites. One of the finest variegated evergreen shrubs. 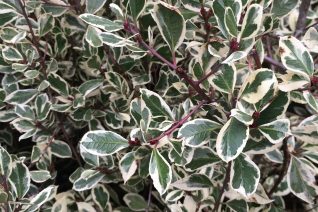 The finely pointed leaves of this fast growing drought adapted shrub are boldly edged in cream with a deep green center. Tiny flowers turn into small bright red berries. Often used as cut foliage- especially around the holidays as the leaves remain fresh for many weeks as cut material. Full sun to part shade in average, well drained soil. Very light summer water to none once established. This mediterranean buckthorn is supremely adapted to drought. In rich soil with summer water it will grow insanely fast and large often toppling under these conditions. Accepts any amount of pruning and its best to do this to produce a denser more root stable plant. It thrives in the worst conditions.